People live in Cohocton for a lot of reasons. Some were born here and have land that was passed down to them over generations. Others are relative newcomers who’ve lived here less than 25 years, a few moving into the area very recently. Many are farmers; others work elsewhere and have chosen to live or retire here; and an increasing number have purchased and developed vacation property on and around our scenic hills. Tourism is growing in the region, while agricultural economics are becoming more difficult. For those who farm it’s primarily a place of industry where you can support a family with hard work and careful use of the land. For most of the remainder, the 3-R (residential, retirement, and recreational) owners, it’s primarily a place of rest where you can enjoy peace and quiet in a rural atmosphere away from the city. Residential owners appreciate being in a small town where you can make friends and raise a family in safety. Many of those who have chosen to retire here were drawn by the breathless natural beauty and tranquility of the land. And most recreational owners searched the region for years before they found the place of their dreams in Cohocton. Residents on both sides of the “industry” vs. “rest” division have been able to live alongside one another happily for years. There have been some rubs, of course, with farm equipment noise, hunters, ATVs, and snowmobiles, but overall the town has been at peace. Enter UPC Wind with its proposal to add a massive industrial wind turbine project into the mix, and we have a formula for social disaster that promises to benefit farmers at the expense of the 3-R owners that surround them. Is this a winner-take-all fight? At Cohocton Free we believe there’s still a path of compromise leaseholders and our Town leaders can pursue that will respect the wishes and preserve the rights of both sides. UPC Wind, leaseholders, and other supporters believe that industrial wind power will mitigate CO2 production, help global warming, benefit local farmers, boost the local economy, and help support the town's tax base. Many believe the wind tower/turbine units are attractive and will enhance the local viewscape. Few believe there will be any problems with noise, bird/bat kill, ice throw, fire hazard, insurance coverage, drop in property values, or decommissioning. Most are in complete support of Local Law #2 of 2006 and feel that the setbacks and provisions specified in this Law are sufficient to safeguard the interests of local residents. This group generally trusts the developer, current local officials, and the PILOT process and believes that enough studying has already been done and that the community should get on with approving and building the project, no matter what opposition may remain. Local wind power critics, many of whom are adjacent landowners, believe that the claims made by the wind industry of potential CO2 mitigation and global warming relief are grossly exaggerated and that the potential benefits to local farmers are outweighed by negative effects on surrounding properties, the community as a whole, and the environment. Most believe the wind tower/turbine units will be an ugly blight that will seriously detract from the local viewscape. Many believe there are significant unresolved problems with noise, bird/bat kill, ice throw, fire hazard, insurance coverage, drop in property values, and decommissioning. Most believe that Local Law #2 of 2006 has inadequate setbacks and provisions to safeguard the interests of local residents, especially adjacent landowners. This group tends to believe that current local officials have been singularly unresponsive to their concerns, that the PILOT process will enrich outside investors and SCIDA at the expense of the local economy, that the developer and many leaseholders have monetary self-interest as a primary motive, and that more study and discussion needs to take place before any project of this magnitude can be approved. Many feel that state-wide standards need to be established for wind power development in New York and/or that the matter should be brought before the local electorate for a community-wide decision. It's taken us a year to arrive at our respective positions, but the result is a deeply divided community with very strong feelings on both sides. The process followed and tactics used on either side have been viewed as deeply offensive by many of those who disagree. Nerves are fraying and tempers flaring. Lawsuits are in the court system with others waiting in the wings, and next fall's electoral process has already begun. Opponents are manning the gunboats while supporters cry, "Damn the torpedoes, full speed ahead!" Obviously, both sides can't be completely right, and sooner or later we will probably find out from our own experience or the experience of others what the truth of these matters really is. In the meantime, is there any room for discussion or compromise? This chart lays out the possibilities. Careful review of the situation indicates that it's been a simple case of poor hospitality, characterized by neglect of the fundamental moral principle expressed by the Golden Rule, from the very beginning. What do we mean by that? Leaseholders, most of whom are members of generational families in Cohocton, have had long discussions with the developer, many going back for several years, about the overall project and its specifics. At first a Fenner-like project was envisioned with perhaps 2 dozen GE 1.5 MW turbines, each about 328 feet tall, scattered throughout the agricultural fields on Cohocton's hilltops. Town leaders and a few trusted others were brought into the discussions, and plans to amend our local zoning laws to allow the industrial use of agricultural land were developed. All of this happened without informing or soliciting the input of adjacent landowners. Fairly rapidly the plans grew from one project to at least two with more than 4 dozen units, first 1.5 MW, then 2.0 MW, and now 2.5 MW each and standing over 400 feet tall. Detailed maps have been available at the Cohocton Wind office on Maple Avenue for over a year that show leaseholders' boundaries, projected turbine sites, and neighboring lands. During this time, leaseholders have given public testimony to the willingness of the developer to adapt its plans to accommodate their wishes. Can one single leaseholder come forward who can honestly say that he has sought out the opinions of the neighbors who border on his land and given their concerns equal weight with his own? Has any leaseholder approached the developer to ask for changes in plans that would accommodate the wishes of adjacent landowners? What we're seeing, instead of a community guided by the Golden Rule, is what appears to be an established and relatively closed society of those "in the know" who are looking out for their own interests vs. what is incorrectly perceived as a motley group of unknown and relatively unwelcome newcomers. To rephrase the situation using a series of words that start with "c", neglecting the Golden Rule has led many to seek concealment, confrontation, and conquest instead of pursuing the higher goals of building individual character and genuine community through fostering open communication, cooperation, and principled compromise. Building personal character by committing ourselves individually to doing the right thing, even if it's uncomfortable or involves personal sacrifice. Becoming a united community that actively reaches out and welcomes the input and participation of all of its members. Arriving at a common decision about wind power development that we can all live with. As Paul Wolcott confessed to me recently, "This isn't really a life or death thing." Sincerely seeking to become a model community - one that leads the way for other communities in similar situations throughout the Finger Lakes region - by taking a serious look at both sides of the question and arriving at genuinely principled decisions about what is the best way to evaluate and regulate wind power development in our area. A. We are appealing to leaseholders to take the initiative to seek out the individual neighbors who own land adjacent to theirs, get to know them on their own terms, and ask specifically if these neighbors have any concerns about how the proposed project will affect them personally. After looking over maps, measuring distances from proposed turbine units, discussing probable sound transmission patterns, impacts on view, and other potential concerns, leaseholders would then bring the requests and concerns of their neighbors to the developer - as if the concerns were their very own - and ask for specific mitigation. The controversial wind project discussions started with them. They've probably lived in the community longer than most of their neighbors. They have constructive access to the developer. Currently power is in their hands. B. We are appealing to members of our Town Board and Planning Board to take their mandate to represent all of Cohocton's citizens very seriously by stepping back from the brink, postponing a decision about turbine site approval, and giving the negotiation and reconciliation process time to develop. It would be helpful if our town leaders would then take the initiative to create a neutral forum for community discussion and mutual decision making, rather than continuously lobbying for the approval of a project that has been highly controversial from the earliest days of its public unveiling last year. C. We are appealing to Chris Swartley, as the local spokesperson for UPC Wind, to take the lessons of his advanced degree in Ethics to heart and advocate for a just and equitable process that improves the social fabric of our community rather than continuously stressing it to the point of rupture. This may result in a significantly scaled-down but sustainable project, which would be a much better outcome for all of us - including UPC - than forcing the adoption of one that has already generated too much negativity, or what our global neighbors in the Far East would call bad karma. Regarding project size, UPC has just completed a wind installation on the Hawaiian island of Maui using 20 GE 1.5 MW turbines with a total nameplate capacity of up to 30 MW. 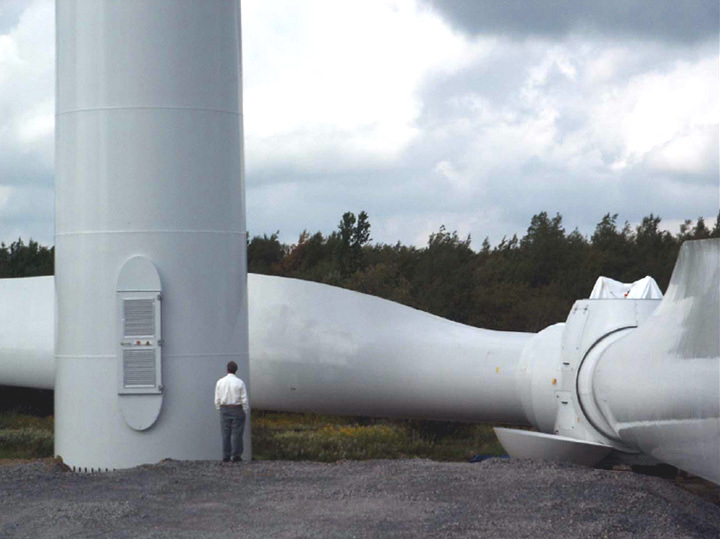 Their project at Mars Hill, Maine, that's attracted so much national publicity for its noise problems and is described by the developer as "the largest wind farm in New England" has only 28 GE 1.5 MW units for a total nameplate capacity of up to 42 MW. There is no reason that UPC has to build two projects in Cohocton with 52 Clipper 2.5 MW units that have a total nameplate capacity of up to 130 MW. And compare the proposed Cohocton PILOT payments with those being described in Mars Hill - they're virtually the same for a project that's 3 times bigger! While he is reviewing the situation, we are asking Chris to address the ethical implications of this disparity. D. We are appealing to local wind critics and adjacent landowners to tone down any confrontational rhetoric, clearly define what their bottom-line concerns and specific requests are, and be prepared to compromise for the overall well-being of the community. What would be reasonable alterations in local zoning, and what would be a reasonable process to establish these? How can we move forward within the spirit and letter of Cohocton's current Comprehensive Zoning Plan or alter it with the blessing of the electorate? E. And we are appealing to the residents of our Town as a whole to pull together to make Cohocton a truly welcoming community, one that receives the newcomer, vacationer, retiree, and commuting resident as valued members of a society of equals. As a united community, we can make a difference in our entire region if we will only listen and follow the prompting, timeless wisdom, and inner guidance that underlies the Golden Rule, an ability that's available as a free gift to each and all of us. We're available to all of you to help in any way we can, for the future of our families, our community, our region, and our nation. Click here for a printable PDF version of this Proposal. Click here to submit your personal comments for public review. DEIS Comments submitted on June 5, 2006 to Sandor Fox, former Chairman of the Cohocton Planning Board. A copy of our June 2006 letter is available here. SDEIS Comments submitted on February 14, 2007 to Raymond Schrader, Chairman of the Cohocton Planning Board. A copy of our February 2007 letter is available here.